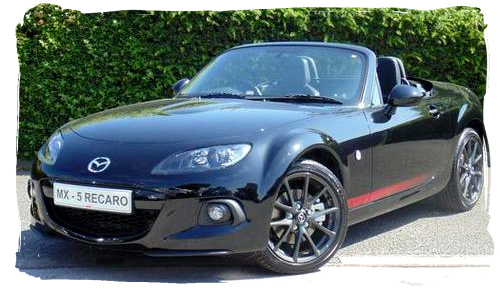 The MX-5 Recaro was not a special edition in the usual sense, for 2013 a select few Mazda dealerships in the UK were offering a version of the NC3 2.0 Sport Tech that included black leather & Alcantara Recaro seats and the exterior graphic stripe from the USA's Club model. This version of the MX-5 was offered as a very limited run with 29 Brilliant Black and 1 Crystal White making just 30 examples available. 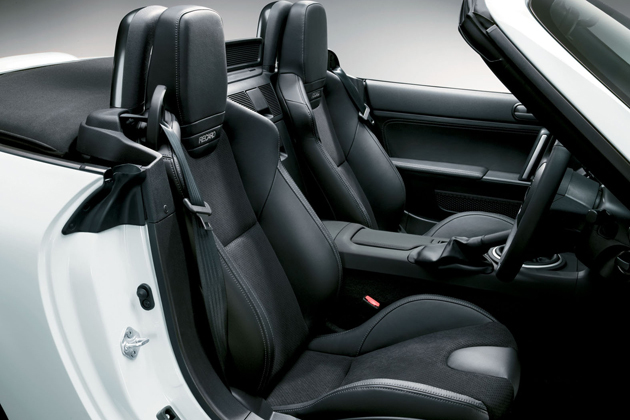 The Recaro seats have previously been available as an expensive option costing thousands of pounds. They were used in some special editions in other markets, notably a red version in Japan's 20th Anniversary model, and featuring stone coloured stitching in the German Karai edition. The seats were also standard equipment in the Australian Roadster Coupe Sports model, it's nice to see they have finally appeared as standard spec on a UK car. You can view an example of the MX-5 Recaro in the Showcase. 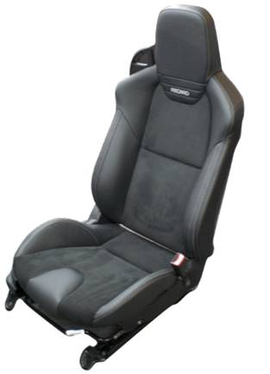 You can see more on these seats on the Recaro website. UPDATE: It's been brought to my attention that more of these Recaro models are being made available for 2014. At least one has been spotted in True Red and Aluminium Silver is also a possibility. There are said to be 18 more cars bringing the total to 48, exact numbers are unconfirmed. It is highly likely these additional cars were originally intended to be upgraded to Jota's GT spec but were left unsold due to poor demand for the high priced Jota model. UPDATE: Lodge (the only Mazda dealer to be selling the Jota GT) have updated their website with details of a 2014 version of the Recaro model. This car strongly resembles the Jota GT but lacks the exhaust and engine modifications and seems to confirm the above.